At the convention, there was a lot of buzz about Mattel’s Barbie® I Can Be™…Architect. Please help us continue the buzz by sharing the following with members so they can vote for their favorite dream house. Check out the designs–the one with the pool slide from the runway is really tempting, but I think I like the Eero Saarinen-esque one the best. At least, I can see myself living and working in those airy, sunny pods quite easily! You can review them all and vote for your favorite, too. 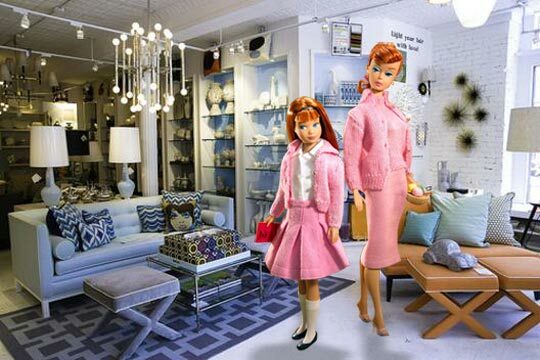 After all, I’m just a Barbie girl, in my Barbie world–life in plastic, it’s fantastic! ← Another reason not to become a "presidential historian"
Tough call Historiann… I liked the one with the elliptical concrete shapes and the three car garage. I liked the realism and the focus on outdoor living. But I ended up voting for the pods because it was the only design that specifically mentioned having a library. Where would Barbie put all her books in those other designs? And WHY has Katie Perry not covered this song yet ????? Giraffe home. Giraffe home. Giraffe home. Fucke all this goddamn shitte! I want my own fucken helicopter! A motherfucken pink one! With champagne! My barbies lived in my mother’s old sewing box, which I harnessed to a knock-off brand horse, so they could head West, wherever that was. Too bad about the tornadoes that left them fighting to escape from burial under bobbins. Times were hard back then. No pods or dream houses or helicopters. Helicopters are too noisy! Flying cars are much quieter.